Yesterday morning we spotted the first pip in an egg – a small hole that the chick created with its beak. 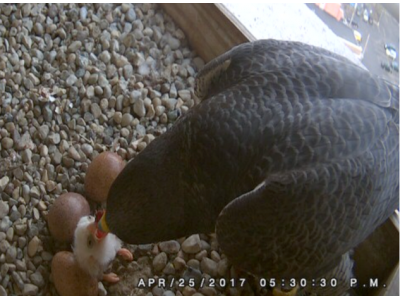 That egg hatched today (4-25-2017)! There is another egg with a pip, so we expect to see a second chick on the 26th. Rebecca has been feeding the first chick and Kewpee came in to incubate the eggs and brood the first chick while Rebecca took a much deserved break. Yours truly will be away from the epicenter of action for a couple weeks. There are some great volunteers who have stepped up to make video clips and I will try to make blog posts while I am away. Your continued interest in the Kalamazoo Peregrine falcons is very appreciated, so bear with us while we work remotely for a short time.